The Holden Racing Team will payspecial tribute to the Spirit of ANZAC with a commemorative livery at thisweekend’s ITM 400 Auckland at Pukekohe Park Raceway in New Zealand. Garth Tander and James Courtney’s HRTVF Commodores will exhibit a one-off design highlighted by a modernised versionof the ANZAC Rising Sun and graphics depicting Australian and New Zealandsoldiers walking side-by-side into battle. The livery has received the approvalof the Returned and Services League of Australia (RSL) and the Royal NewZealand Returned and Services’ Association (RSA). As part of the occasion, HRT’s ANZACTribute will raise awareness to the RSL’s ANZAC Appeal, which runs to ANZAC Dayon Thursday April 25 and the RSA’s Poppy Day Appeal, which this year willtake place next Friday April 19. 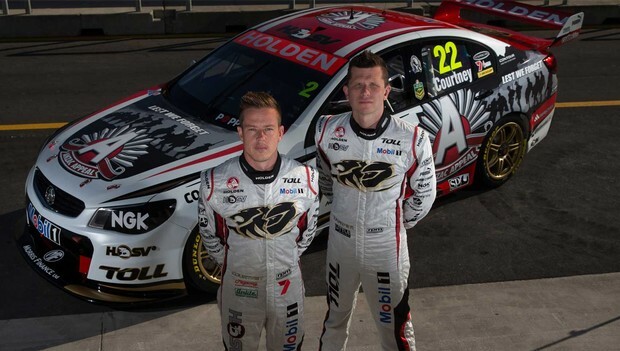 V8 Supercars Champions Tander andCourtney said they were honoured to carry the ANZAC Tribute into competition. “Honoured and proud is the bestdescription of how I feel about being able to pay tribute to the Spirit ofANZAC and to the brave men and women who have served our two countries,”Tander said. “ANZAC Day is no longer just aboutthe original soldiers who landed at Gallipoli in 1915, nor is it just a publicholiday. “The Spirit of ANZAC is a reflectionof our life’s values – courage, compassion, camaraderie and commitment, andbeing there to help a mate. In addition to his HRT Commodore carryingthe ANZAC Tribute, Courtney will wear a commemorative helmet, custom paintedfor the event. “I’m proud that the Holden RacingTeam is in a position where we can acknowledge and respect such a special dayin Australia and New Zealand’s history,” Courtney said. “Our tribute not only commemoratesthose in the original Gallipoli campaign, but every person who has served ourcountries ever since – including those still serving today. “The RSL in Australia and NewZealand’s RSA have done incredible work for generations helping veterans andtheir families when they need it. Holden Motorsport and Sponsorship Manager Simon McNamara said, "The ANZAC spirit is an unbreakablebond between Australia and New Zealand and we are extremely proud the factoryHolden Racing Team is able to pay tribute with its commemorative livery. “HRT’s ANZAC Tribute aligns itselfwith our involvement in the NRL ANZAC Test between the Holden Kangaroos and NewZealand, and Collingwood’s traditional ANZAC Day AFL Clash with Essendon at theMCG. HRT’s ANZAC Tribute will be seen ontrack for the first time in practice at 10.10am (NZ time) today at PukekohePark Raceway.